Staying on top of price movements of various binders, solvents and additives is critical especially if you are in the business of manufacturing specialised products. The data can help you optimise your raw material usage and ultimately your profit margins. ICIS provides a broad coverage of chemicals used in paints, coatings and adhesives, including acetone, vinyl acetate monomer, and more. What are the current trading prices of key chemicals? What blends should you adopt to optimise profitability? What are the daily/weekly prices of key chemical raw materials? ICIS pricing reports provide regional price assessments of key chemicals that are traded regionally and globally. They are published weekly, enabling you to keep track of trading prices, understand price drivers/fluctuations and have a reliable benchmark for contract price settlements. 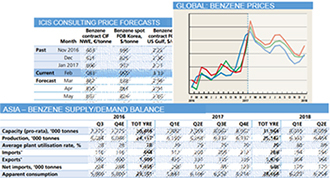 What are the forecast prices for benzene in the next 12 months? ICIS consultants forecast the likely trading prices of benzene in the coming 12 months, based on the supply and demand dynamics and market developments. Will there be supply/demand imbalances over the long run that can push up prices of key chemicals? 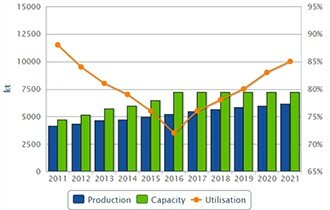 ICIS Supply and Demand data enables you to gain a mid- to long-term view of key chemical markets.